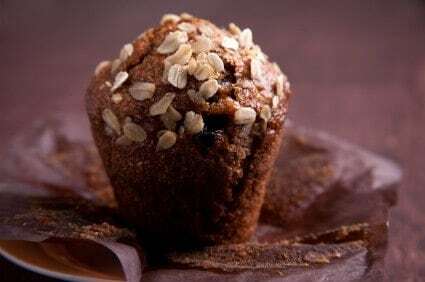 Home » Bread Recipes » Date-Nut Muffins – these sweet muffins with bits of walnuts and dates are perfect warm out of the oven. These hearty muffins are wonderful on Sunday mornings served with butter. This recipe is from the archives of my grandmother, Ethel Eynard. Jefferson City, MO. 1975. These sweet muffins with bits of walnuts and dates are perfect warm out of the oven. Grease 12 muffin cups. In a medium bowl stir together dates, boiling water, corn oil, and vanilla. In a small bowl stir together dates, boiling water, corn oil, vanilla. In a small bowl stir together flours, sugar, walnuts, and baking soda. Add to date mixture; stir just until flour mixture is moistened. Spoon mixture into prepared muffin cups. If desired, sprinkle muffins with oatmeal for decoration. Bake in 375 degree often for 25 minutes or until golden brown. Immediately remove from pan. Cool on wire rack or serve warm. The recipe repeats itself about putting the dates, boiling water,corn oil and vanilla in a bowl…I figure the medium bowl is best so the dry ingredients could be added. Not a big deal, big I wanted you to know because the muffins sound fabulous and sip one people won’t make them if they are confused. I’m going to make a loaf of quick bread with this recipe, slice and toast it in the morning. Then scheme are it with philly cream cheese…HEAVENLY! Thank you! This is an excellent recipe! Yummy. Just made some and I can’t stop eating them. I will say that it only made 8 standard-size muffins. So unless you have really tiny muffin tins, I’m not sure how you get 12 out of this recipe. But it doesn’t matter, because they taste fabulous!